requirements to conduct business in their state. 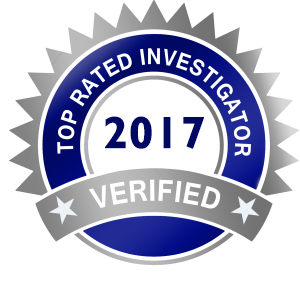 Display the Top Rated Investigator seal on your website to let your clients know they are dealing with a verified and trusted licensed investigator. Let your visitors know that you have passed the TRI-Verification. When visitors click on your Seal, a window will show that you’re a verified Top Rated investigator. Displaying the Top Rated Investigator seal on your website is the fastest way to help build visitor confidence, increase conversions, and potentially increase sales. It typically takes 72 hours before your information is fully vetted and confirmed. We will look up your company information with the State regulatory boards, and confirm you meet all the state requirements to operate as a licensed investigator. To verify your employment, we must send and receive an e-mail from your company. The signature line must must include your contact information, company name, company website, your active roll at the company, and a confidential notice. Finally, we must verify that you are the owner or an authorized representative of the company in which you are trying to receive the seal for. Once we have received the required information, your seal will be activated and you will be able to place your seal on your website.